One of the shots from our ad. Hey there Happy Friday Folks! I'm so glad it's a friday for you. I really am. It's always a pleasure to see people relaxing and enjoying time together around a good flick, delicious food and hilarious company. I'm writing to you to finally reveal another part of myself that I often don't talk about...my singing life. No, I'm not currently working as a professional but I do get to create music for professional ads with my husband. This recent work for Union Pacific as been passion work because it's for their Great Big Rollin' Railroad competition. So who knows if we will win the grand prize or not?! But the adrenaline, fun and hard work we put into our fun ad was worth every minute of us trying. We have until the end of June to have family, friends and awesome people vote for us. So let me walk out of my introverted self and ask, "Would YOU please vote for us?" I would truly appreciate your vote as it will be a factor in the judging process. All our winnings will go to my husband's education into becoming a character animator. Every last bit helps when it comes to financial aid. Oh, and I forgot to mention (the entire reason for the title of this post), yes, I sang the tune to the ad we created and added all my little harmonies via Garage Band. According to my mother and me, I've always loved singing and creating music. Music to me, has always been a salve for a broken heart, an anthem of courage for times I am afraid and a way to tell my loved ones how much they mean to me. So yes, maybe one day I'll find enough courage to sing in front a crowd again. But for now, I do all my crooning behind a mic in our humble apartment and for ads that need a happy tune to convey a particular message. Happy Friday Everyone! Hope this post finds you well off and ready for a fun weekend. My husband first introduced me to The Counter restaurant last year. His co-workers took him there and then he decided to take me on a surprise date, knowing how much I love new food experiences. No surprise, it was a burger spot but with a fun twist! Instead of a typical menu, we each received a clipboard with a menu card where we could customize our meal. So far, I like. Not only that, I was thrilled with the selection of side orders and greens you could top off your burger. So instead of getting a bun, I could go almost carb-free with their selection of salads and greens (alfalfa sprouts, please). 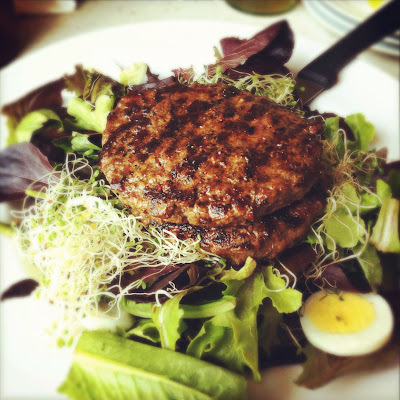 To make things ever better, my angus beef was not treated with hormones (have enough to spare) or antibiotics. Good to know just in case if and when I get pregnant and have a craving for a burger I know where to get a good one. But I've heard pregnancy can usually do the opposite to a carnivorous woman, one day meat the next day beet. 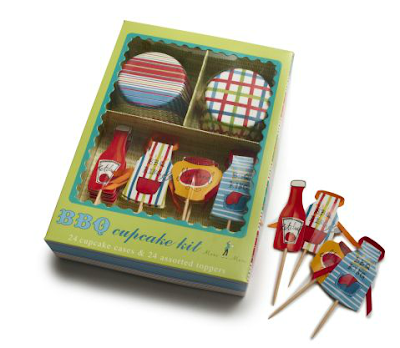 It's summertime and why not have fun with blue icing, fish-shaped candy and cupcakes? I found this container of fish candy at Toys R' Us and was inspired to decorate cupcakes for Summer. I should make an entire week of summer themed cupcakes. What you see is what you get on these babies. Blue icing, candy and light brown sugar for sand. Oh btw, I found some really cute pre-made cupcake decorators at Sur La Table this past weekend. Really adorable stuff from Meri Meri. 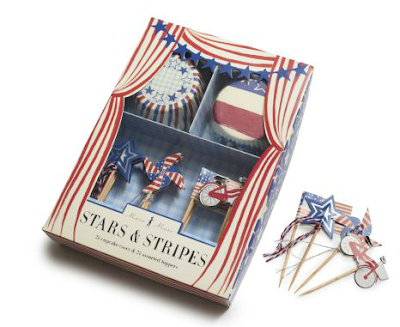 Thank you Meredithe and team of creatives for making our parties and baking incredibly chic! Happy Friday! Hosting a party? 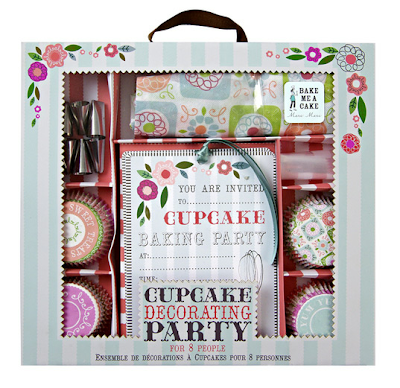 Why not a Cupcake Baking Party with this lovely Cupcake Bakery party kit. It's Friday and I had to share something food related. So I'm sharing a photo of a cupcake I completely enjoyed. I'm currently on a mission to figure out a chocolate cupcake recipe of my own that I can be proud of. So many recipes out there but it's time I concoct one from my laboratory. I try and recollect my favorite cakes and there are a handful that I really liked. One of them was made by a cute little old lady that lived in Independence, Missouri. I never got the chance to get the recipe from her. It was perfectly moist and chocolatety and I should have eaten more. Bummer. Do you have a favorite chocolate cake recipe? Happy Friday and enjoy the weekend! !